The Islands of the Galapagos are geologically interesting. 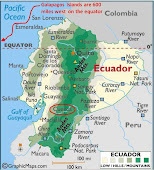 The islands are 600 miles from the Ecuadorian mainland and have never been attached to the continent. The isolation of the islands for millions of years explains why the limited number of plants and animals are found there. Theories abound as to how the plants and animals that are there, did arrive there. You are not going to see mammals that are endemic to the islands. The islands are volcanic in origin. The earth’s molten core has outlets to the surface of the earth that are known as “hot spots.” These outlets are not a “pipe” to the surface but are a tree of “cracks” that allow molten lave to rise to the surface. Thus the islands of Galapagos are sea mountains of lava that have risen above the sea level. As eons pass, the tectonic plate (Nazca plate) that carries the surface of these islands is moving in a mainly eastern and southern direction at a rate of 1.5 inches to 2 inches per year. Eventually the islands are moved off the hot spot and new mountains/islands are formed on their previous location. Thus the southern and western islands of the Galapagos group are the oldest islands, and they have eroded significantly over time and have more flora and fauna. Only the northern and western islands have mountain peaks on them and they have less flora and fauna. This feature is easily noticeable as one travels from island to island. One constant feature is that the lava is basalt and looks the same on every island (except perhaps the color). If the basalt passes through a concentration of iron in its rise to the surface, the basalt lava will have a red color. As lava flows, the outer core of the lava will cool as the inner core continues to flow. The inner core will empty and thus lava tunnels are formed. Eventually over time with erosion, the tunnels will collapse (see pics). A huge crater on Santa Cruz that is a collapsed lava tunnel. There are several of these. The flow of lava is clearly seen with small collapsed lava tunnels. A walkway to the top of barren volcanic island of Bartolome. This was a hot place an eon ago. A view of Pinnacle Rock on the right that was actually formed by US WWII gunnery practice. This view was used in the movie "Captain and Commander"
The geology can be studied from the sea. Molten rock on top of molten rock. Picture was added to show a red beach (granules of basalt). A rugged sea shore where we watched birds dive for fish.